supervisor_account 09.2018 Welcome Yabei Li, and Yufeng Wang to join our lab! supervisor_account 08.2018 Welcome Taihong Xiao, Tiantian Wang, Yu-Ding Lu, and Rakesh Jasti to join our lab! supervisor_account 07.2018 Welcome Julia Chang and Shih-Han Chou to join our lab! description 07.2018 Papers accepted in ECCV 2018 and BMVC 2018! description 03.2018 Papers accepted in CVPR 2018! Jifeng Ning, Jimei Yang, Shaojie Jiang, Lei Zhang, and Ming-Hsuan Yang, Visual Tracking via Dual Linear Structured SVM and Explicit Feature Map, CVPR 2016. Yuankai Qi, Shengping Zhang, Lei Qin, Qingming Huang, Hongxun Yao, Jongwoo Lim, and Ming-Hsuan Yang, Hedged Deep Tracking, CVPR 2016. Chao Ma, Jia-Bin Huang, Xiaokang Yang, and Ming-Hsuan Yang, Hierarchical Convolutional Features for Visual Tracking, ICCV 2015. Yi-Hsuan Tsai, Ming-Hsuan Yang, and Michael Black, Video Segmentation via Object Flow, CVPR 2016. Jimei Yang, Brian Price, Scott Cohen, Zhe Lin, and Ming-Hsuan Yang, PatchCut: Data-Driven Object Segmentation via Local Shape Transfer, CVPR 2015. Sifei Liu, Jimei Yang, Chang Huang, and Ming-Hsuan Yang, Multi-Objective Convolutional Learning for Face Labeling, CVPR 2015. 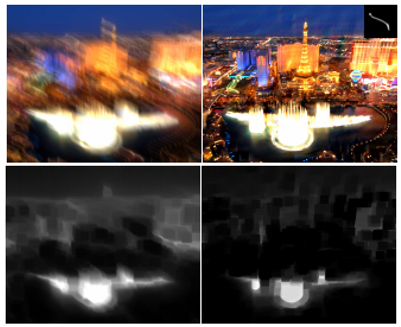 Jinshan Pan, Deqing Sun, Hanspteter Pfister and Ming-Hsuan Yang, Blind Image Deblurring Using Dark Channel Prior, CVPR 2016. Zhe Hu, Lu Yuan, Stephen Lin, and Ming-Hsuan Yang, Image Deblurring using Smartphone Inertial Sensors, CVPR 2016. Wei-Sheng Lai, Jia-Bin Huang, Zhe Hu, Narendra Ahuja, and Ming-Hsuan Yang, A Comparative Study for Single-Image Blind Deblurring, CVPR 2016.